That’d be awesome AND appropriate. 1. Have I made this joke before? I’m pretty sure I made this joke at some point. I don’t think it was in comic form though, so I think I’m good. 2. This is comic number six hundred and sixty six. 3. Have a good day. This entry was posted on Friday, March 8th, 2013 at 12:00 am and is filed under Comics. You can follow any responses to this entry through the RSS 2.0 feed. Both comments and pings are currently closed. Sometimes I have to second guess myself whenever I write jokes because I wonder if I’m paraphrasing another joke I heard from either of you guys. I was sad the other day because I had a DnD comic joke that started with a character saying “this is hardly ideal”, then realized I was quoting L.H. Franzibald. If I wrote Massive Pwnage as a Shonen Manga, it probably would have ended before 600 chapters, but it also would have around 8-10 pages per chapter so it ultimately would have been longer anyway. Come to think of it, the Into Darkness arc was pretty much my Shonen Arc, haha. 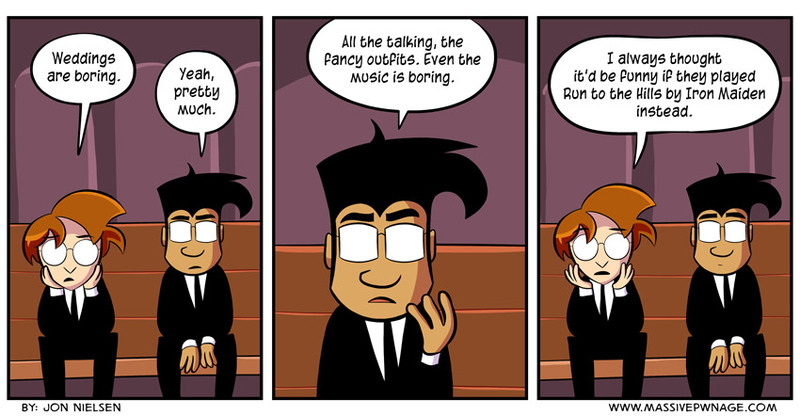 If I ever got married, I would like to hear the Final Fantasy overture.